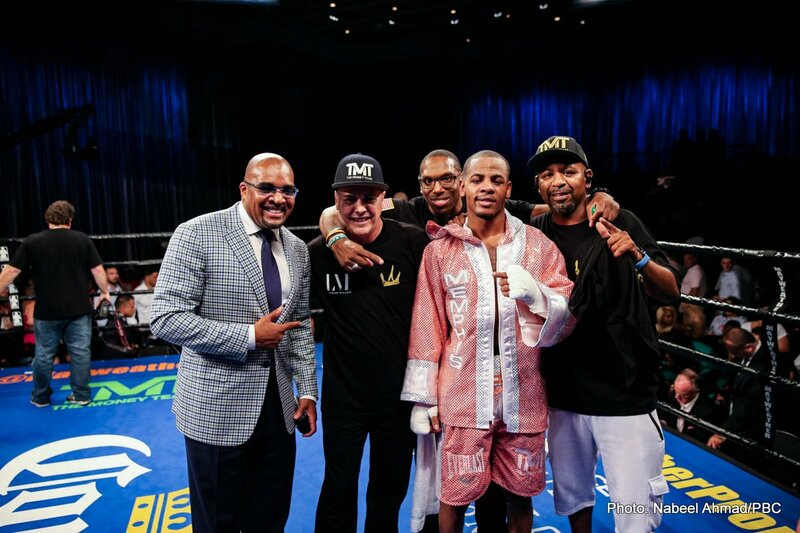 Lightweight contender Ladarius Miller (17-1, 5 KOs) won a competitive unanimous decision over Dennis Galarza (16-4, 9 KOs) in the main event of Premier Boxing Champions on Bounce Friday night from Sam’s Town in Las Vegas. The 25-year-olds spent the first few rounds feeling each other out before the action heated up as Miller began to find some space inside with his speed. Miller’s southpaw attack saw him look to jab inside before darting to the right to deliver left hands. “I fought a tough opponent but I felt like I went in there and did what I was supposed to do,” said Miller. “I thought I controlled the fight the way I wanted to, but it wasn’t my best performance. I know that I can come back even better. Galarza’s work rate began to increase with Miller’s upped aggressiveness as he found success with his jab and countering some of the movement Miller flashed. In a fight that appeared close throughout, Miller’s speed and effective straight left hands, combined with counter right hooks, gave him the decision in the eyes of the judges by scores of 96-94, 97-93 and 99-91. Additional televised action saw former title challenger Sharif Bogere (32-1, 20 KOs) win a hard fought unanimous decision over Chile’s Oscar Bravo (23-8, 11 KOs) in their 10-round super lightweight showdown. Bogere showed off an impressive arsenal, stinging Bravo early with a check left hook and combination punching that left his opponent bleeding from his left eye from the early rounds. Bravo pushed forward and tried to trap Bogere against the ropes while throwing power punches, despite the impairment. Even with the 10-round onslaught from Bravo, Bogere was able to consistently counter and hurt Bravo, never allowing the Chilean fighter to put him in any real danger. The judges all saw the fight for Bogere with scores of 99-91 and 100-90 twice. In the opening bout of the telecast, unbeaten Juan Heraldez (14-0, 8 KOs) rode a first round knockdown and impressive combination punching on his way to a unanimous decision victory over Kevin Watts (11-3, 4 KOs) in their 10-round super lightweight matchup. Heraldez delivered a thundering counter left uppercut that sent Watts to the canvas in the opening frame of the fight. Watts was able to survive the round but it set the tone for what was to come, as Heraldez was consistently landed the cleaner and more powerful punches. Watts attempted to get back in the fight leading with a power left hook but Heraldez was able to keep him at bay and deliver his own offense to earn the victory by scores of 100-89 and 98-91 twice. Premier Boxing Champions on Bounce will also be available to be streamed live via Bounce’s new subscription-video-on-demand service Brown Sugar, which features an extensive and one-of-a-kind library of iconic black movies as well as Bounce original programming and series. Brown Sugar is available on Apple TV, Roku, Amazon Channels, Amazon Fire TV, Amazon Kindle, Android and Apple smartphones and tablets and web browsers via BrownSugar.com. Brown Sugar also has Google Chromecast capabilities which allow video to play on televisions directly from mobile devices and tablets for consumers with Android and iOS devices. There is a free initial trial period for subscribers with a retail price of $3.99/month thereafter.